This is my 45th installment of Babywearing Stories 365. Each installment features a babywearer in 1 photograph and their answers to 5 questions. My goal is to normalize, promote and celebrate daily Babywearing, moving beyond *what* we use to carry our babies and shifting focus back on *why* and *where* we carry. I hope to share the stories of moms, dads, and babywearing caregivers all over the world. Enjoy! 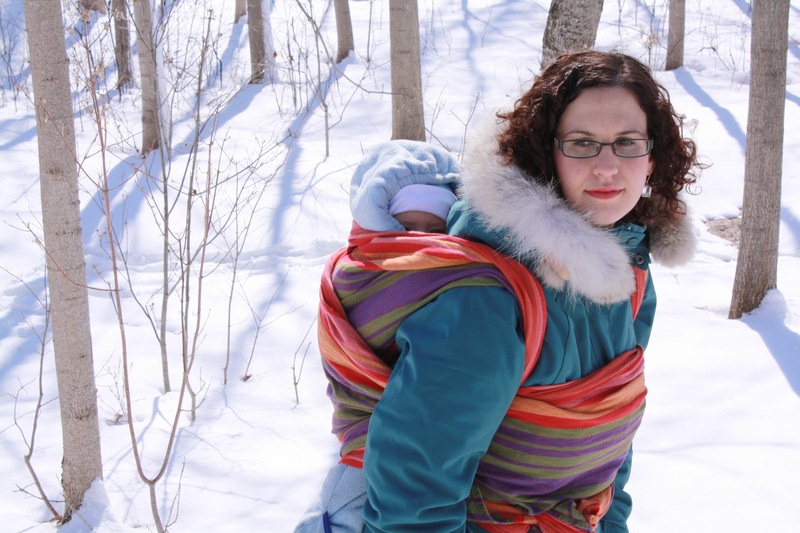 My dear friend Amanda Greavette introduced me to babywearing before my first child and I was lucky enough to learn this invaluable parenting tool early on. This photo was taken two years ago in March but I’m reminded of it during Maple Syrup season in Northern Ontario, Canada. I wore Oscar (7 mos) while my daughter, Norah (almost age 2), played with friends. I don’t remember who took this picture, but I think the shadows are haunting and the colour contrast against the wrap is beautiful.